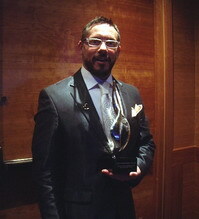 Once again Canadian’s took home top honors at the Special Event Show Gala Awards last weekend in Phoenix. The Annual award program showcases the best of the global event industry and as expected Canadian planners were among the leaders. The mission of the Steve Kemble Leadership Foundation is to develop and nurture leadership skills for special event and meeting industry professionals through recognition of achievement, click involvement and educational opportunities. Throughout his career Ken has been a visionary, mentor and leader and is very much deserving of this honor.